FCF conducts research and monitoring in order to make effective wildlife management decisions and promote long-term sustainability of wildlife and their wilderness. This includes working collaboratively with TAWIRI, the environmental research arm of the Tanzanian Government. The aim is to continuously monitor wildlife populations in the areas where FCF operates to assist in the management of these areas. 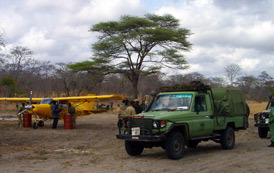 The program includes aerial surveys, ground counts of species, targeted lion population surveys as well participating in monitoring the rhino population in the Serengeti eco-system.